The June Bateman Fine Art is pleased to announce Flora & Fauna, an exhibition of photographs by Joseph Jurson and Nick Brandt. The work of each of these artists involves close personal observation of and involvement in the natural world. Both Jurson and Brandt produce exquisite prints with the larger goal of integrating photography into an active engagement with the natural world. 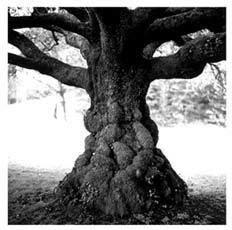 Joseph Jurson has long been a gardener and for over 20 years has photographed in his own garden and in the natural landscapes of New England. For most of that time Jurson worked with the large-format cameras favored by most traditional landscape photographers but in recent years has switched to medium format. This shift of technique has allowed him to achieve a high level of spontaneity and intimacy that is reflected in the images of roots, branches, and other floral details being shown in this exhibit. Faced with the complex, the tangled, the overgrow,n Jurson enters into the local environment seeking images that speak through and beyond the chaos. The nineteen 17"x17" silver gelatin prints exhibited in Flora & Fauna present Jurson's involvement with the world with an exquisite yet plainspoken eloquence. 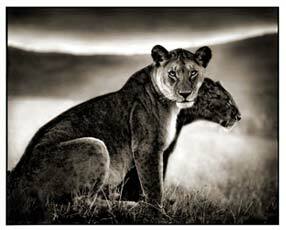 Just as Jurson's work comes out of an abiding love of gardening, Nick Brandt's stems from a lifelong love of animals. While directing a Michael Jackson video in East Africa he became enchanted by the land, its people, and especially its animals which led to the series of photographs he has called "There is a Place: Elegy of a Vanishing World." In engaging with this world, Brandt has rejected the cliches of traditional landscape photography which use telephoto lenses to capture animals at dramatic moments for shooting with a pentax camera with wide angle lens in close proximity of his subjects in an approach that suggests intimate observation and even interaction with the animals as they quietly inhabit their home environment. Rather than suggest a false image of pristine nature untouched by human presence, Brandt at times portrays his subjects in the human environments into which they wander and even in moments where the mutual presence of the photographer and the animal is acknowledged through eye contact. Brandt revels in his presence within this extraordinary world, using closely guarded techniques to produce beautiful, romantic, and highly subjective archival digital prints. Nick Brandt was born and raised in London, England. He studied Film and Painting at St. Martins School of Art in London. He is an award winning director of music videos and commercials both in England and in the United States and is currently working on a number of feature film projects. Nick Brandt's work can be found in numerous private collections and in the corporate collection of Dow Jones, Inc. An article on Nick Brandt featuring three pages of his African photographs will be published in the July/August 2003 issue of Black & White Magazine. Nick Brandt lives with his wife and a menagerie of adopted animals in Topanga, California. Joseph Jurson was born in Detroit, Michigan in 1957 and trained as a photographer at the University of Michigan School of Art. He received a Merit Award at the Northern Westchester Center for the Arts in a juried exhibition judged by Debra Singer, Associate Curator at the Whitney Museum of American Art. His work is included in numerous private collections including those of Peter and MaryAnne Bradford, Bill and Carol Castagnoli, and Martin and Lee Moskof. Corporate collections include Museum Editions and Pfizer, Inc.